Please note: The entertainment and fair schedules on this website have not been updated for 2019. Information will be corrected as soon as changes have been confirmed and contracts signed. Please check back for the exciting entertainment planned for the 2019 Ashtabula County Fair. Be entertained by this high energy act as K-9s show off their skills leaping, jumping and entertaining the crowd. Meet the stars of the show afterwards, too! Shows daily. The Firefighter Training Show plays off every child’s curiosity to one day be a "Firefighter - Heroes." All kid size and kid friendly equipment that produce big size fun for all! Shows daily. 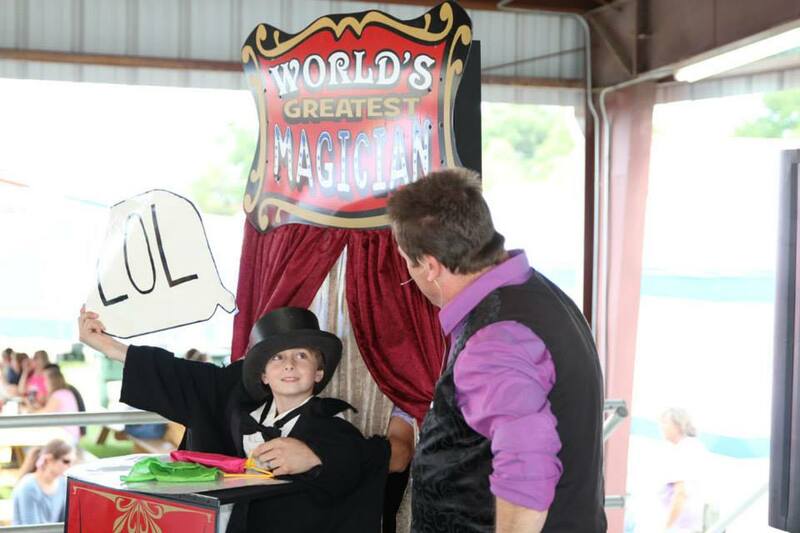 The thrill of magic is in the air with this fun and family friendly show. This father and son duo will keep you guessing - and smiling. Shows daily. Adorable monkeys are the centerpiece of this show as they spread their sunshine to audiences. Be entertained and educated at the same time! Shows are Tuesday through Saturday. Amazing animals and rousing reptiles abound in Jungle Terry's performance. Look for Jungle Terry on Tuesday and Thursday through Sunday in the Barnard Entertainment Center. Thank you for making the 2018 Ashtabula County Fair a great success. We appreciate the support of everyone in the community who participated, attended or sponsored an event at the fair. You made this wonderful family fun event possible. Jason Brinker - Morgan Twp. ​ Tony Felicijan - Trumbull Twp. Scott Johnson - Monroe Twp. Bart Kanicki - Pierpont Twp. Thomas Mazzaro - Williamsfield Twp. Deborah Platt - Plymouth Twp. twelve months to be eligible to pull a petition. and retain the revenue derived from the sales. New merchandise auctions - Expo Center - Sundays 5:00 p.m.
3/13 Concession Office - Board of Directors meeting 7:00 p.m.
4/7 Expo Center - AXI Wholesale / New merchandise auction 5:00 p.m.
4/10 Concession Office - Board of Directors meeting 7:00 p.m.
4/28 Quality Assurance - 1:30 p.m. Expo Ctr, FFA & Commercial Bldg. 5/4 Market Animal Tagging Day 7 a.m. - 12:30 p.m.
5/5 Expo Center - AXI Wholesale / New merchandise auction 5:00 p.m.
5/8 Concession Office - Board of Directors meeting 7:00 p.m.
5/10-5/12 Star Family Circus - Indoor circus - Commercial Bldg. 5/11 Ashtabula County Solid Waste / Tire collection - 9 a.m.-1 p.m. The 2018 Ashtabula County Fair runs from Tuesday through Sunday in the second week of August in beautiful Jefferson, Ohio. This year's event promises to have something for everyone with exciting grandstand shows, 4-H livestock events, Draft Horses, contests for the young and young-at-heart, delicious food, and a chance to reconnect with your community. Check our daily schedule for the full listing of events and look at the Fair Book to see the many ways you can participate. We'll continue to update this website with events happening this summer and throughout the year. Looking forward to seeing you at the Ashtabula County Fair!